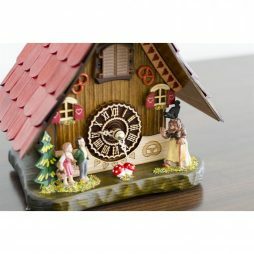 Mantel quartz cuckoo clock featuring Hansel and Gretel. Movement features 12 melodies and cuckoo call. Made in Germany. 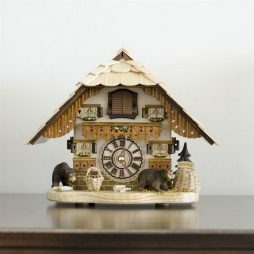 This little cuckoo clock is as sweet as summer honey, and the bear cubs certainly think so, too! Two bear cubs lumber about this classic German-styled home in search of a snack, and make some mischief in the meantime. This clock plays 12 different melodies as well as the cuckoo call on the hour. Mantel quartz cuckoo clock with bears. Made in Germany. 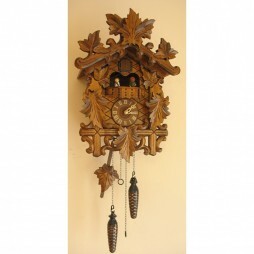 This traditional hand carved Black Forest clock features a solid wooden case, dial, and pendulum. The cuckoo presents itself every hour to count the hour and the quartz movement chimes the cuckoo call with a waterfall background. Dimensions: 20.5 x 12 x 6.5 inches. This cuckoo depicts a Black Forst chalet scene. The cuckoo presents itself every hour to count the hour and the quartz movement chimes the cuckoo call with a waterfall background. Dimensions: 19.5 x 10 x 6 inches. Quartz, battery operated cuckoo clock. Chalet design with Bears. Dimensions: 11 x 11 x 11 inches. Made in Germany. Quartz cuckoo clock with painted flowers. Made in Germany. Dimensions: 14 x 13 x 13 inches. 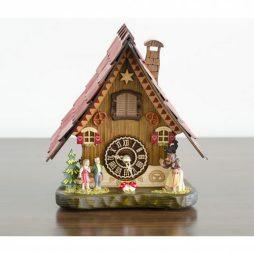 This cuckoo clock features four dancing figurines that rotate. The cuckoo presents itself every hour to count the hour and the quartz movement chimes the cuckoo call with a waterfall background. Dimensions: 18.5 x 12.5 x 6 inches. Made in Germany. 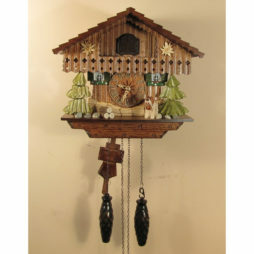 This is a charming and inexpensive chalet cuckoo clock. The details and dog figure are hand carved from solid wood. When the clock strikes the hour the door opens, a cuckoo appears and calls along with the sound of a waterfall and other birds of the forest. After the call, one of two delightful tunes will play, celebrating the hour. This clock is made in Germany for Sternreiter. 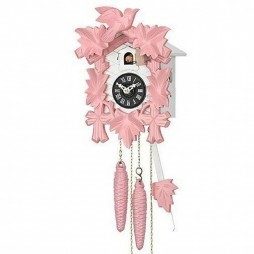 Add a petite charm to the walls of your home with this Pink Quartz Cuckoo Clock. It is a soft and glossy wall clock that is carved out of solid Linden wood and has garlands of maple leave and pines hanging from it. The beauty of this clock is its carving and color that complement each other. Made in Germany, this musical, pink color clock has a 1-year warranty and an automatic night shut-off switch. Go ahead and lay your hands on this endearing piece today! 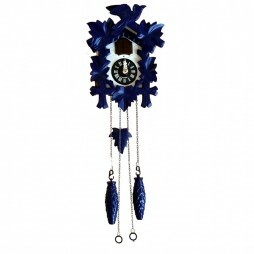 Add a vibrant pop to the walls of your home with this Blue Quartz Cuckoo Clock. It is a bright and glossy wall clock that is carved out of solid Linden wood and has garlands of maple leave and pines hanging from it. The beauty of this clock is its carving and color that complement each other. Made in Germany, this musical clock has a 1-year warranty and an automatic night shut-off switch. Go ahead and lay your hands on this endearing piece today! 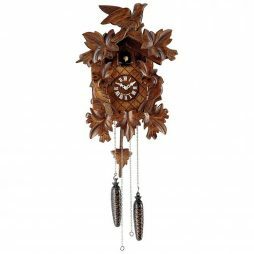 Beautify the dcor of your house with this exquisite Musical Quartz Cuckoo Clock with Hand Carved Birds by Romba. 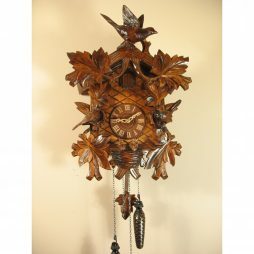 This beautiful walnut finish Germany made clock features hand carved birds, grape leaves, maple leaves, vines and nest that amplify the its elegance. The incredibly lifelike little birds are hand-carved in three dimensions. This clock is musical and plays one of its 12 tunes along with the call of a cuckoo when the clock strikes the hour or half-hour. Featuring wooden clock and numbers and carrying a 1 year warranty, this clock also has a photo sensor which turns off the sound when it is dark. Surround your child with the lovely sound of this beautiful Orangucoo Monkey Clock by Xanadoo. An adorable design in a heart-touching black, white/cream finish and a red flowery pendulum is sure to attract the children. This battery operated clock has a cute little animated door and a cute little monkey character that enhance the beauty of this clock. The little monkey comes out of the door and makes cheerful sounds when the clock hits the hour. The zebra stripes housing and the magnificent dial, make this clock a must have. This elegant piece is based on the accurate quartz mechanism and features a night sensor. Surround your child with the lovely sound of this beautiful Orangucoo Monkey Clock by Xanadoo. An adorable design in a heart-touching black, white/cream finish and a red flowery pendulum is sure to attract the children. This battery operated clock has a cute little animated door and a cute little monkey character that enhance the beauty of this clock. The little monkey comes out of the door and makes cheerful sounds when the clock hits the hour. The zebra stripes housing and the magnificent dial, make this clock a must have. This elegant piece is based on the accurate quartz mechanism and features a night sensor. 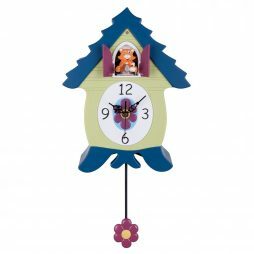 Give your child a perfect company with this adorable Anna Poultree Chicken Cuckoo Clock by Xanadoo. 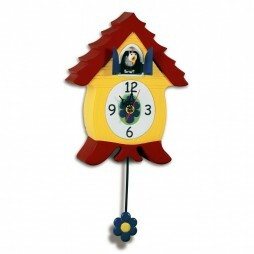 A beautiful and eye-catchy yellow-red finish on a perfect design makes this clock the best thing for your child?s room. 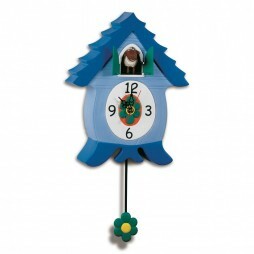 The blue little animated door and the blue pendulum add to the beauty of this battery operated clock. 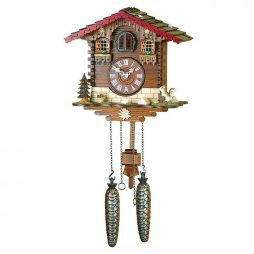 Based on the accurate quartz mechanism, this clock houses the adorable Anna Poultree hen or chicken that comes out of its door and makes a cheerful call when the clock hits the hour. The night sensor in this clock shuts off the sound of the hen or chicken when it is dark. Light up the aura of your children’s room with this adorable Needle nose Ned Barkcoo Clock by Xanadoo. An elegant and beautiful design in a soothing brown and tan finish and a red pendulum make this clock a must have for your little one?s room. When the clock hits the hour, a cute little dog pops out of the doors and welcomes all with a woof and a pant. The animated door and the animated dog character are sure to attract the little children and win their hearts. This battery operated clock features automatic night shut-off, which shuts off the character when it is dark. Bring home a new friend for your little ones in the form of this adorable Hannah Holstein the Cow Cuckoo Clock by Xanadoo. The adorable design, beautiful animal sound and the lovely green colors with a purple swinging pendulum make this battery operated clock a must have for the kids. When the clock hits the hour, the cute Hannah Holstein the Cow pops out of the doors with her bovine greeting. This adorable clock is based on the accurate quartz mechanism and also features a night sensor that automatically shuts off the character when the room becomes dark. The clock also has a side button for encore performances. Let your kids enjoy the company of this adorable EleCoo Elephant Cuckoo Clock by Xanadoo. A beautiful pink design with brown roofing and bottom and a swinging red flowery pendulum is sure to attract the little ones. Featuring an automatic shut-off button and an adorable animal sound, this clock is a perfect choice for the kids. When the clock strikes the hour, an adorable and happy elephant pops out of the doors and trumpets her glee. The beautiful animated door and the animal character enhance the beauty of this battery operated clock which is based on the accurate quartz mechanism. Bring a big smile on the face of your children by putting this EwenisWooley in the EweCoo Clock by Xanadoo in their rooms. An eye-catchy design and a magnificent blue color make this clock a tremendous piece. Featuring a flowery swinging pendulum, an animated door and an animal character, this wall is sure to win the hearts of the little kids. This battery operated clock is based on the accurate quartz mechanism. When the clock strikes the hour, a cute little sheep pops out of the doors to bleat her greeting. There?s a night-time a light sensor that automatically shuts off the character when the room becomes dark. When you combine modular designs with traditional cuckoo mechanisms, the Design Meets Cuckoo Wall Clock is what you get. This telltale is a beautiful clock that has a contemporary design that can blend well with all sorts of decor themes. The clock has a rhombus-shape. It features two hands and a cuckoo house in black on the dial. 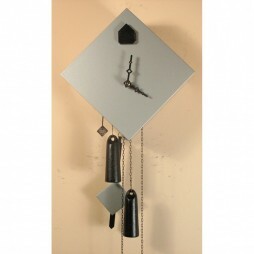 The silver and black colors of this clock blend in a soft fashion to bestow grace upon the walls of your home. 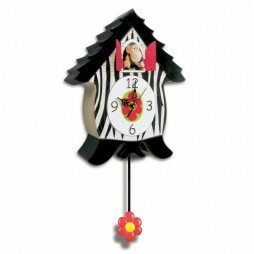 Get this VDS-certified Black Forest clock today and breathe an air of style onto your walls. Take a peep into the world of old filigree designs with this special Filigree Wall Clock. Combining the rustic notes of the yesteryears with the vibrant hues of today, this clock is an exquisite piece of watch making craft. It is a stunning traditional wall clock that can easily fit into any decor. 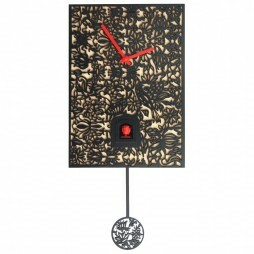 This clock features an eclectic filigree design in black with a petite pendulum in the same pattern. To add an electric look to this clock, the makers have given it bright red hands. Another stellar feature of the clock is its small cuckoo bird that sits out and calls the hour and half hour. It accompanies the gushing sounds of the waterfalls and chirrup of birds. Get this melodiously charming piece of time for your home today. When you visit a friend or family member’s home, what kind of clock do you see on the wall? Is it a large wall clocks, a contemporary clock, or a decorative wall clock? What you may not expect is a cuckoo clock. 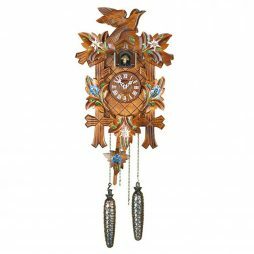 Because not everyone has a quartz cuckoo clock, don’t you think it might be the perfect accessory for your family or living room? 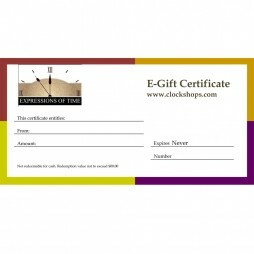 You can find cuckoo clocks of all kinds at Expressions of Time. It doesn’t matter if your tastes are modern, traditional or whimsical. We have a clock that will best accent your home furnishings. The Rombach und Hass Design Meets Cuckoo has clean lines and is primarily gray and black, perfect for a contemporary space. But just because it’s more modern, doesn’t mean the traditional cuckoo bird has been forgotten. A wooden bird will still chirp at the half and full hour. For the young at heart and someone who wants something more fun and whimsical, the MeowCoo Tommy Tango Cat Clock might just work. 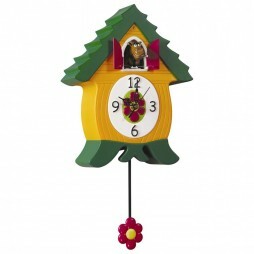 This quartz cuckoo clock is bright and colorful. More feminine, this clock features a flower pendulum and center face. 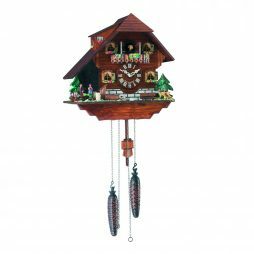 For a more traditional 1 day cuckoo clock, consider a Rombach chalet. With wood tones and detailed carvings, a Rombach goes well in any room. Shop now and showcase a one of a kind timepiece in your home. 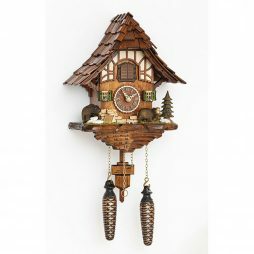 Once you’ve found the perfect cuckoo clock, add to your cart and checkout. 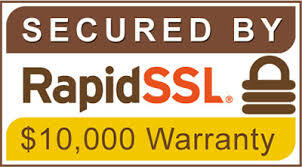 If you have any questions, make sure to call us at 866.467.6460.